The term includes traffic detection and surveillance, arterial management, freeway management, transit operations, demand management, electronic toll collection, and many other strategies. Despite the fairly narrow, technology-focused definition, the ITS program has historically looked beyond technology and addressed all aspects of intelligent transportation systems including their development (e.g., the systems engineering process), operation, and evaluation. The regional ITS architecture in particular takes a broader, systems perspective of ITS that includes other elements of a “system” involved in providing a transportation service, including the roles and responsibilities of operators, institutional coordination and agreements, and the flows of information between system elements. In fact, the regional ITS architecture is designed to be technology-independent, further blurring the distinction between “operations” and “ITS.” This broader view of ITS overlaps with operations, which makes the regional ITS architecture a significant tool for supporting operations in the metropolitan/ statewide transportation planning process. For the purposes of this primer, the terms ITS and operations will be used as defined above. ITS will be viewed as the systems involving electronics, communications, or information processing used to support management and operations. The transportation planning process includes development of a regional vision and goals, identification of alternate improvement strategies, evaluation and prioritization of strategies, development of the transportation plan and transportation improvement programs, project development, and systems operations.3 It is a continuing, collaborative, and comprehensive process that includes the consideration of several critical factors: economic development, air quality, budgets, and others. Planning for operations is a joint effort between planners and operators to support improved regional transportation systems management and operations. It requires coordination and collaboration between a number of regional partners, including planning staff and operations staff from metropolitan planning organizations (MPOs), State departments of transportation, transit agencies, highway agencies, toll authorities, and local governments. It involves the consideration of management and operations (M&O) strategies in transportation planning – including the integration of M&O strategies in metropolitan and statewide transportation plans. The recommended approach focuses on working toward desired system performance outcomes for transportation system users, such as increased travel time reliability, rather than just responding to problems. It acknowledges the widely-accepted principle that what is measured matters in decisionmaking, and setting specific, measurable performance objectives will facilitate incorporating operations strategies into the metropolitan and statewide transportation plans as well as agencies' operating budgets. 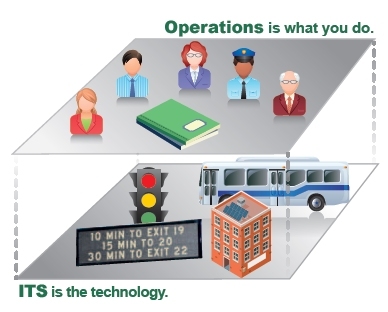 Operations strategies take a variety of forms including programs or projects focused on managing and operating the transportation network, projects to deploy ITS infrastructure, programs that fund operating and maintaining new and existing ITS infrastructure, and operations elements of major capital projects. Developing operations objectives that state what a region plans to achieve regarding the operational performance of the transportation system is the center of this approach to planning for operations. Operations objectives are included in the region's transportation plan and provide strategic direction for including operations programs and projects in the plan and statewide and metropolitan transportation improvement programs (STIP/TIP). These objectives provide specific, measurable, agreed-upon statements of system performance that can be tracked on the regional level and inform investment decisions. The approach provides a direct connection between operations objectives and investment decisions. Operations objectives may address concerns such as recurring and non-recurring congestion, access to traveler information, emergency response time, incident management coordination, and transit operations, among others. Regions create operations objectives that are tailored for their size, resource availability, political commitment for operations, and performance monitoring capabilities. Regional Goals. Establish one or more goals that focus on efficiently managing and operating the transportation system. Operations Objectives. Develop operations objectives. specific, measurable statements of performance. to include in the metropolitan or long-range statewide transportation plan (MTP/LRSTP) that will lead to accomplishing the goal or goals. Performance Measures. Using a systematic approach, develop performance measures, analyze transportation performance issues, and recommend M&O strategies. M&O Strategies. Select M&O strategies within fiscal constraints to meet operations objectives for inclusion in the MTP/LRSTP and STIP/TIP. The approach (shown in Figure 5) is iterative, with monitoring and evaluating used to refine and adjust operations objectives over time. Coordinating and collaborating among planners and operators is a critical component of the approach, which supports developing agreed-upon regional operations objectives, identifying strategies, and monitoring and evaluating system performance. 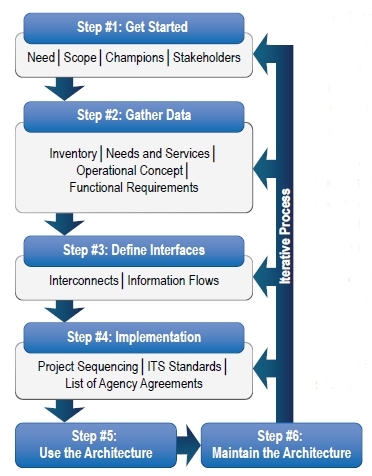 Figure 5 illustrates the approach to planning for operations guided by operations objectives and founded on performance measures and data. 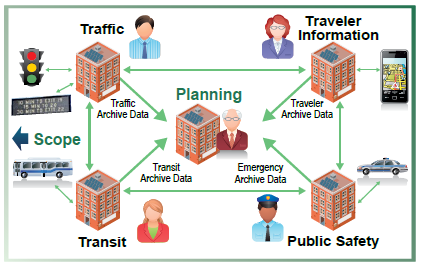 The figure shows the basic elements of the transportation planning process with a focus on management and operations. 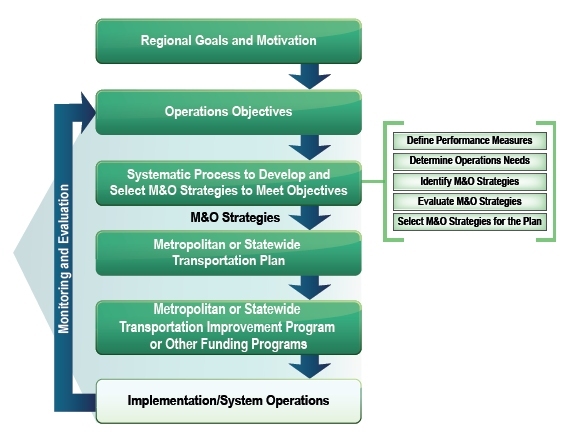 When applied, the objectives-driven, performance-based approach to planning for operations is frequently integrated into the transportation planning process such that management and operations is combined with other types of regional needs and solutions such as safety, environment, accessibility, and security in the development of objectives and the systematic process to develop and select strategies for the plan and improvement program. The congestion management process (CMP), as outlined in SAFETEA-LU, uses an objectives-driven, performance-based approach to address congestion in a region.8 The CMP is a federally-required process for MPOs in areas with populations over 200,000. The CMP is used to identify congestion and its causes, propose mitigation strategies, and evaluate the effectiveness of implemented strategies. It is an integral part of the planning process that influences decisionmaking and feeds projects and strategies directly into the plan and TIP. In some metropolitan regions, this may be the primary use of the objectives-driven, performance-based approach to integrating operations into the metropolitan planning process. U.S. Department of Transportation, FHWA, Advancing Metropolitan Planning for Operations: An Objectives-Driven, Performance-Based Approach – A Guidebook, FHWA-HOP-10-026, 2010. Available at: http://www.ops.fhwa.dot.gov/publications/fhwahop10026/index.htm, last accessed August 29, 2011. U.S. Department of Transportation, FHWA, Advancing Metropolitan Planning for Operations: The Building Blocks of a Model Transportation Plan Incorporating Operations – A Desk Reference, FHWA-HOP-10-027, 2010. Available at: http://www.ops.fhwa.dot.gov/publications/fhwahop10027/index.htm, last accessed August 29, 2011. U.S. Department of Transportation, FHWA, Congestion Management Process: A Guidebook, FHWA-HEP-11-011, 2011. Available at: https://www.fhwa.dot.gov/planning/congestion_management_process/cmp_guidebook/, last accessed August 29, 2011. U.S. Department of Transportation, FHWA, Statewide Opportunities for Integrating Operations, Safety and Multimodal Planning: A Reference Manual, FHWA-HOP-10-028, 2010. Available at: https://www.fhwa.dot.gov/planning/statewide/manual/index.cfm, last accessed August 29, 2011. U.S. Department of Transportation, FHWA, Regional Concept for Transportation Operations: The Blueprint for Action – A Primer, FHWA-HOP-07-122, 2007. Available at: http://www.ops.fhwa.dot.gov/publications/rctoprimer/index.htm, last August 29, 2011. Ongoing rapid advances in information processing and communications technology create new opportunities for transportation professionals to deliver more efficient and effective transportation services. Many of these opportunities are predicated upon effective coordination between organizations – at both an institutional and technical level. To encourage and enable this coordination, the U.S. DOT has developed a set of tools that support development and use of a "regional ITS architecture" that is intended to help identify and exploit these opportunities for cost-effective cooperation. A regional ITS architecture is intended to be a cornerstone of planning for effective inter-agency integration and for deployment and operation of technology-based projects. Complementing planning for operations, a regional ITS architecture supports planning for integration. On the next page, Figure 6 shows a notional view that includes many of the key components of a regional ITS architecture. As shown, most of the regional ITS architecture is devoted to showing all of the existing and planned operational transportation systems in a region and how they will fit together. From a planning perspective, the regional ITS architecture should support the region's objectives and also support the specific needs of transportation planning agencies. It should show how data is collected, archived, and processed to support transportation planning and performance monitoring. The regional ITS architecture consists of a number of components, including quite a few that are useful in transportation planning and referenced in later chapters of this primer. Each of the components answers one or more key questions about the integrated transportation system that is planned for the region. Let's take a minute to introduce you to the key components of a regional ITS architecture. For the most benefit, locate and open your regional ITS architecture (most regional ITS architectures are available on-line) and look at how it covers each of the following regional ITS architecture components. Scope: The regional ITS architecture definition begins with a clear statement of the geographic and jurisdictional boundaries, the time horizon, and the scope of transportation services that are covered by the architecture. The Rule/Policy leaves a lot of latitude to the region in defining the scope, but suggests that the regional ITS architecture cover the entire metropolitan area at a minimum. Transportation planners should make sure the scope is as consistent as possible with the scope of the regional transportation planning activities to facilitate use in planning for operations. Stakeholders: A list of the traffic agencies, transit operators, public safety agencies, traveler information providers and other organizations and groups that plan, develop, operate, maintain, and use the regional transportation system is included in every regional ITS architecture. This broad stakeholder list should include all of the agencies that are involved in transportation planning, operations, and management as well as groups that use the transportation system (e.g., fleet operators) or impact its operation (e.g., special event venue owner/ operators). A typical stakeholder list might include 50 agencies and other organizations by name, accompanied by a short description. In 1997, Congress passed the Transportation Equity Act for the 21st Century (TEA-21) to address the need to begin to work toward regionally integrated transportation systems. In January 2001, FHWA published Rule 940 (ITS Architecture and Standards) and FTA published a companion policy to implement Section 5206(e) of TEA-21. This Rule/Policy seeks to foster regional integration by requiring that all ITS projects funded from the Highway Trust Fund be in conformance with the National ITS Architecture and officially adopted standards. "Conformance with the National ITS Architecture" is defined in the final Rule/Policy as using the National ITS Architecture to develop a "regional ITS architecture" that would be tailored to address the local situation and ITS investment needs, and the subsequent adherence of ITS projects to the regional ITS architecture. This Rule/ Policy continues under the current Federal transportation act. Roles and Responsibilities: The regional ITS architecture does more than list the stakeholders; it defines the high-level roles and responsibilities of each of the stakeholders that operate and manage the transportation system as part of an "operational concept" for the region. The roles and responsibilities are short statements like "Share CCTV video feeds with other agencies in the region" and "Share Fire CAD feeds with DOT." Inventory: This is a list of the existing and planned components or "elements" of the regional transportation system. The inventory elements are frequently systems in their own right and include the operational centers (e.g., a State DOT Freeway Management Center), field equipment (e.g., the dynamic message signs, closed-circuit television (CCTV) cameras, and signal systems), vehicles (e.g., transit vehicles and public safety vehicles), and traveler equipment (i.e., the devices the traveler uses). Importantly for planning, the inventory should also include any monitoring and data collection systems that are used by transportation planners. The objective in defining the inventory is to include enough detail to identify the key integration points – the endpoints for the inter-agency interfaces and other interfaces that are prime candidates for standardization. Interfaces: A definition of the interfaces between the inventory elements is a focal point of the regional ITS architecture. Each interface is represented as both an "Interconnect" (Is there a connection between the two elements?) and as a set of information flows or "architecture flows" that describe the information that is shared. The architecture flows are also associated with relevant ITS standards. 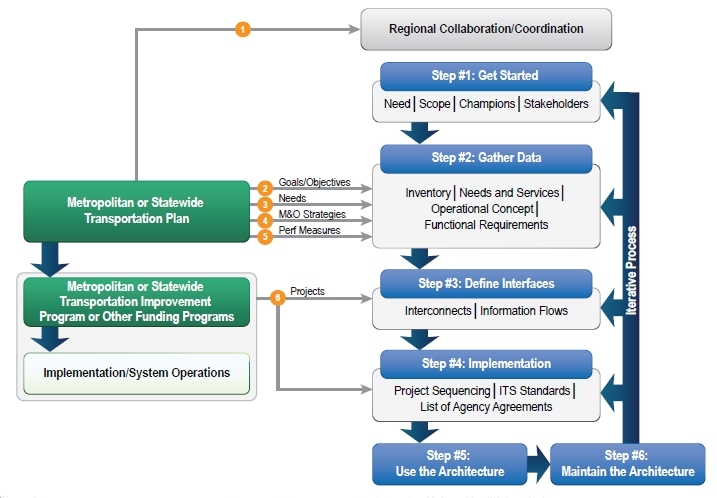 Project Sequencing: The regional ITS architecture is implemented through many transportation programs and projects that occur over years or even decades. The regional ITS architecture includes a sequence that allocates projects to broad timeframes like near- (0-3 years), mid- (3-7 years), and long-term (8+ years). The project sequencing often provides finer granularity than the ITS services, particularly for near-term projects. Agreements: The regional ITS architecture also includes a list of agreements, though it may not be fully populated in your regional ITS architecture. The idea is that institutional coordination is required to support the technical integration that is shown in the architecture. The list of agreements should identify the existing and planned agreements in the region that are needed to support an integrated transportation system. Note that the agreements should extend beyond implementation into operational agreements that define agency roles and responsibilities for system operation. A regional ITS architecture is developed using the process shown in Figure 10. This process is defined in detail in the Regional ITS Architecture Guidance Document. A brief overview of the process will suffice for most readers of this primer. The key steps are summarized here. Gather Data: Once the stakeholders are involved and a plan is in place for assembling their input into a consensus regional ITS architecture, the focus shifts to the ITS systems in the region. In this step the existing and planned ITS systems in the region are inventoried; the roles and responsibilities of each stakeholder in developing, operating, and maintaining these ITS systems are defined; the ITS services that should be provided in the region are identified; and the contribution (in terms of functionality) that each system will make to provide these ITS services is documented. Define Interfaces: Once the ITS systems in the region are identified and functionally defined, the existing and planned interfaces between these systems are defined. First, the connections (or "Interconnects") between systems are identified, and then the information that will be exchanged on each of the connections is defined. Implementation: Once the system interfaces are delineated, additional products can be defined that will guide implementation of the projects that will flow from the regional ITS architecture. These include a sequence of projects, a list of needed agency agreements, and a list of standards that can be considered for project implementation. Use the Regional ITS Architecture: The real success of the regional ITS architecture effort hinges on effective use of the architecture once it is developed. The regional ITS architecture is an important tool for use in transportation planning, programming, and project implementation. It can identify opportunities for making ITS investments in a more cost-effective fashion. This step is where the benefits are realized. This step is the focus of this primer. Maintain the Regional ITS Architecture: The regional ITS architecture must be updated as ITS projects are implemented, new ITS priorities and strategies emerge through the transportation planning process, and the scope of ITS continues to evolve. A maintenance plan is used to guide controlled updates to the regional ITS architecture baseline so that it continues to accurately reflect the region's existing ITS capabilities and future plans. Chapter 4 includes ideas for enhancing your architecture so that it better supports planning for operations in your next architecture update. U.S. Department of Transportation, RITA, U.S. National ITS Architecture Web Site. Available at http://www.its.dot.gov/arch, last accessed August 25, 2011. U.S. Department of Transportation, RITA, Turbo Architecture Web Site. Available at: http://www.iteris.com/itsarch/html/turbo/turbomain.htm, last accessed August 25, 2011. U.S. Department of Transportation, FHWA, Regional ITS Architecture Guidance Document, FHWA-HOP-06-112, 2006. Available at: http://www.ops.fhwa.dot.gov/publications/regitsarchguide/index.htm, last accessed August 25, 2011. U.S. Department of Transportation, FHWA, Systems Engineering for ITS Handbook, FHWA-HOP-07-069, 2007. Available at: http://ops.fhwa.dot.gov/publications/seitsguide/index.htm, last accessed August 25, 2011. U.S. Department of Transportation, FHWA, Systems Engineering Guidebook for ITS Web Site. Available at: https://www.fhwa.dot.gov/cadiv/segb/, last accessed August 25, 2011. After reviewing the objectives-driven, performance-based approach for planning for operations in Section 2.2 and the development of the regional ITS architecture in Section 2.3, it is easy to see similarities between the two processes and get a sense that there is potential in leveraging a closer connection. This section looks at the potential connections between the two processes. The objectives-driven, performance based approach for planning for operations and the regional ITS architecture process have complementary strengths. The architecture development process begins with an understanding of regional needs and the current state of the transportation system based on input from a broad coalition of stakeholders. It results in a planning framework (the regional ITS architecture) and a sequence of integrated projects that implement a portion of that framework. The strength of the regional ITS architecture process is its development of an integrated view of the regional transportation system based on a set of identified services or strategies. This complements the planning for operations approach, where the focus is on defining the most effective strategies for a region based on high-level goals and operational objectives. By connecting the two processes, you combine the strong basis for selecting strategies in planning for operations with the strength of the architecture development process in defining an integrated framework based on selected services. Linking the regional ITS architecture and the process for integrating operations into transportation planning (i.e., "planning for operations") depends on factors such as the format of planning for operations in the region, the accuracy and thoroughness of the regional ITS architecture, and when the updates of the plan and architecture occur. 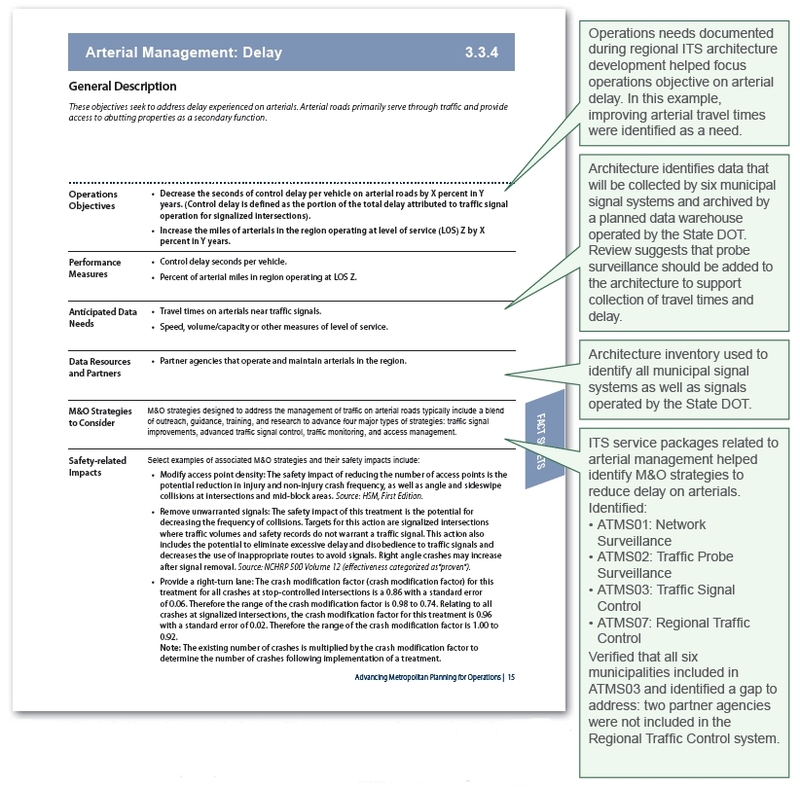 The next several pages show three alternative scenarios for connecting the architecture and planning for operations based on the relative timings of the updates. The benefits and challenges associated with each scenario are listed in Section 4.4. In this scenario, an existing regional ITS architecture is used to support planning for operations as part of a metropolitan or statewide transportation plan update. The architecture is used as a resource that can provide useful input to incorporating operations into the planning and programming processes. This regional ITS architecture will not undergo a major update as part of this scenario. 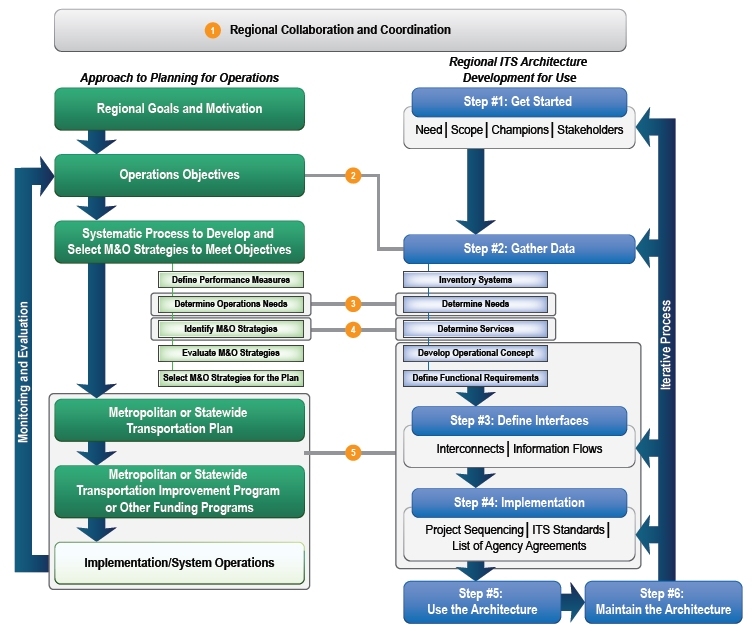 Figure 11 shows seven opportunities for the regional ITS architecture to provide input to the objectives-driven, performance-based approach to planning for operations. Each numbered opportunity corresponds with a connection in the figure. 1. Leverage any existing collaborative ITS groups to assist with the integration of operations into the metropolitan or statewide transportation planning process. 2. Examine elements of ITS in the architecture such as the ITS needs and services to gain information on the operations issues and envisioned operational services for the development of operations objectives. 3. Identify data available to support performance measures for tracking objectives and monitoring system performance. 4. Obtain information on operations needs by looking for gaps in regional functionality of ITS services and stated operations needs. Examine the needs associated with operating and maintaining the ITS infrastructure already in place. 5. Gather ideas for potential M&O strategies by examining the ITS services or service packages selected for the architecture. 6. Examine the ITS inventory elements associated with ITS services/service packages that relate to M&O strategies in the plan to help define projects and programs that include both implementation and ongoing operations and maintenance of ITS. Use the list of projects in the ITS architecture to also provide input to project definition for the STIP/TIP. Select ITS-related activities to be funded that are consistent with the ITS architecture. 7. Mine information flows, ITS standards, and other information from the architecture to support project development and implementation. 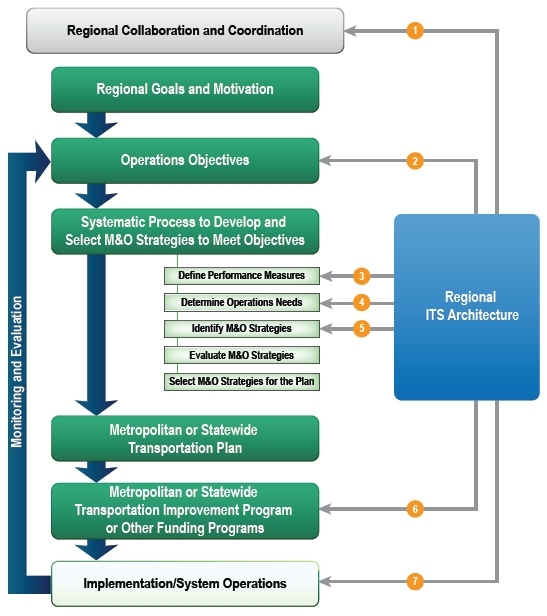 When the regional ITS architecture is updated following the development of the metropolitan or statewide transportation plan, the architecture supports planning for operations by responding to the strategic direction set by the goals, objectives, and M&O strategies incorporated into the plan. The architecture is used to "drill down" into how the M&O strategies, programs, or projects can be regionally integrated into the transportation system and what ITS may be needed for implementation. This is illustrated in Figure 13 below. As above, each numbered opportunity listed corresponds with numbered connections in the figure. 1. Leverage any regional operations planning groups to support the ITS architecture update. 2. Identify goals and operations objectives from the transportation plan to direct the decisions made in the architecture update. 3. Adopt and update the system performance needs defined for the region during the development of the plan. 4. Select service packages or services that correspond to M&O strategies selected for the plan. 5. 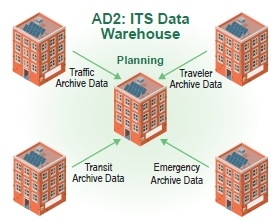 Incorporate archived data services and appropriate flows in the architecture to support performance measures selected to track operations objectives and system performance. 6. Update the ITS inventory, interconnects, and information flows to account for any newly planned M&O/ITS programs and projects. A regional ITS architecture updated in conjunction with the transportation plan for the metropolitan area or State opens up the greatest opportunities for leveraging the synergies between the processes. There are opportunities to combine or closely associate steps in the planning for operations and ITS architecture update processes to eliminate duplicative efforts. Figure 14 highlights five important connections that can be leveraged between the two processes for a more effective, coordinated transportation system. As an overview, these five primary areas of linkage are 1) regional collaboration and coordination across processes, 2) operations objectives and the overarching "gather data" step, 3) operations and system performance needs, 4) M&O strategies and ITS services, and 5) defining and implementing operations programs and projects in a regionally integrated context. 1. Regional collaboration and coordination. The processes are conducted by overlapping groups of transportation operations and ITS stakeholders including staff from planning agencies, State and local road operating agencies, transit agencies, public safety, and others. In many cases, the same regional committee that supports the regional ITS architecture can also support planning for operations, leveraging the overlaps and opportunity for synergy between the two activities. The composition of the staff may shift from management to technical as the work moves from strategic to implementation. In many regions, though, the same individuals at an agency focus on integrating operations into the planning process and developing the regional ITS architecture. Leveraging the same agencies, if not the same individuals, for both processes yields benefits in terms of knowledge transfer and outreach requirements. 2. Operations objectives and gather data. In the second step of the regional ITS architecture development, gather data, several significant activities occur that should both influence and be influenced by the development of operations objectives. It is critically important for connecting the two processes that the operations objectives guide the identification of needs and services in the architecture. This will be discussed in several places in the primer. The systems inventory conducted early in the architecture development can provide useful information on the available sources of operations data that could be used to track measurable objectives. Data availability is a significant factor in establishing specific objectives. In addition, the operations expertise of the stakeholders brought together for the regional ITS architecture should be leveraged in setting the direction for operations in the region. 3. Operations and system performance needs. The regional ITS architecture update calls for the stakeholders to "determine needs and services." This task is fundamentally a planning task that should be coordinated with the overall transportation planning process. 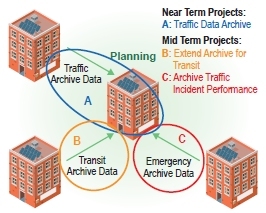 When the plan and architecture are updated at the same time, these parallel activities can be combined for a more coherent and efficient process. When combined, the operations needs of the transportation system can be identified once based on the regional operations objectives and overall goals and used in both the update of the architecture and planning for operations to drive the identification of operations solutions. 4. M&O strategies and ITS services. Identifying M&O strategies to include in the metropolitan or statewide transportation plan is parallel to the “Determine Services” task of the ITS architecture update. Many aspects of these two processes can and should be combined for the sake of efficiency and consistency. The ITS services identified for a regional ITS architecture are selected from a comprehensive menu of “service packages” and there is considerable overlap between service packages and M&O strategies. The exceptions include those M&O strategies that are not based on ITS and the ITS services for improved safety, environment, and others without an operations focus. M&O strategies are evaluated and selected for inclusion in the transportation plan, at least at the metropolitan planning level. To enhance coordination with the overall planning process, the regional ITS architecture may include those services that are planned or currently existing. Where there are differences, the regional ITS architecture could indicate which services are explicitly included in a plan. 5. Defining and implementing operations programs and projects in a regionally integrated context. The operational concept, functional requirements, and interfaces that are defined in the regional ITS architecture can be used to improve understanding of the integration needs and dependencies between projects. The detailed definition of each project in the regional ITS architecture helps to identify the scope of an operations project or program and the roles and responsibilities for implementing ITS as well as operating and maintaining it over the long-term. Developing a schedule for program and project funding as part of the STIP or TIP development can also be performed in conjunction with project sequencing in the regional ITS architecture. The list of projects arising from the regional ITS architecture should be consistent with the sequence of projects and programs in the STIP/TIP. During project development and implementation, the interconnects, information flows, list of agency agreements, and ITS standards of the regional ITS architecture should be mined for input.